The mark on the top signifies that the item was reassayed, worker´s head with hammer in use 1927-54, 916/1000 silver content. The first mark bottom left, "P in circle", is the mark for "restaurated goods", in use 1951; the second mark on the bottom from left is the mark of Moskowskaja Juwelirnaja Fabrika = Moscow Jewelers Fabrik. 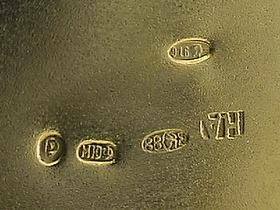 The meaning of this set of marks is that this object was made in the year 1896 in Moscow by the well known silversmith Aleksejev N. W. and was in the year 1951 restaurated and reassayed with the communistic mark in the Moscow Jewelers Factory.